Affiliate Terms & Conditions – amTopo by Apogee Mapping, Inc.
amtopo.com is owned and operated by Apogee Mapping, Inc. By joining our Affiliate Program, you acknowledge that you have read, understood and agree with the terms and conditions. Apogee Mapping Inc. (amtopo.com) reserves the right to add, delete and/or modify any of the terms and conditions in this Agreement, at any time and at its discretion alone, by posting a notice announcing a change or a new agreement on the Apogee Mapping, Inc. (amtopo.com) website. If you do not wish to accept a particular amendment, you only reserve the right to terminate the agreement and your participation in the Affiliate Program. Your continued participation in the Affiliate Program following notice of a change or a new agreement on the Apogee Mapping, Inc. (amtopo.com) website will automatically constitute acceptance of the changes. You must use the Affiliate Program in a manner that demonstrates common sense and respect for the rights of Apogee Mapping, Inc. (amtopo.com) and third parties. At its discretion alone, with or without notifying you, Apogee Mapping, Inc. (amtopo.com) reserves the right to terminate this agreement and your participation in our affiliate program immediately, should you commit fraud in your use of our affiliate program or should you abuse this program in any way. If such fraud or abuse is detected, Apogee Mapping, Inc. (amtopo.com) shall not be liable to you for any commission for such fraudulent sales. You will get 15% of the sales revenue for each of our products you manage to sell. This applies to all maps and map bundles offered on amtopo.com and is applied to each order’s total amount, excluding shipping costs. We currently pay our affiliates via check or PayPal, if a PayPal account is provided. We send out payments on the first day of each month provided the affiliate balance is $10.00 or more. If the affiliate balance is less than $10.00, a payment will not be sent until the first of the month following when this minimum amount has been reached. All payments will be in US Dollars. Step 1: Click on the “Affiliate Center” link located at the bottom of any amtopo.com web page. This will take you to a Log In form. If you already have a customer account, you may log in using your existing Username and Password, or, you can fill out the full form then click the “Sign Up” button. Apogee Mapping, Inc. will need to approve your request, and upon doing so, you will receive an email notification stating you have been accepted as a new Affiliate. where “#” will be the unique ID assigned to you. You will add this unique Affiliate URL to your own website which, when clicked, will redirect your visitors to the amtopo.com website. If any of those redirected visitors purchase products on amtopo.com, you will earn 15% of the resulting sale. You will need to replace the “#” with your own unique ID, and we recommend changing the text Affiliate link to something of your choosing. 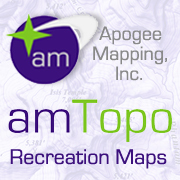 Most Affiliates assign this code to an amTopo or Appogee Mapping, Inc. graphic (banner, image, etc.) or use a simple text hyperlink. Feel free to use these graphics, or contact Apogee Mapping, Inc. should you need a custom design. Step 4: You are finished. Start earning money! As you earn commission, you can visit the Affiliate Center any time to see performance reports, number of sales, total earnings, commission paid, and more. Our Affiliate program will detect each click generated by your unique Affiliate ID and store a cookie on the visitor’s computer. If that visitor makes a purchase on the amtopo.com website within 30 days of the first click, you will receive 15% of the sale, excluding shipping. Contact Apogee Mapping, Inc. at 970-403-5866 for additional information about our Affiliate Program.